One in an occasional series in which FOW publishes articles that appeared in our publications in the past, and still resonate with us today. This piece was written by Susie Wilmerding, current FOW Director and appeared in FOW’s Winter 2008 Newsletter. Susie is the current chair of FOW’s Habitat Committee and former chair of the Conservation Committee. Invasive plants are a problem that the Wissahickon Valley shares with most other natural areas throughout the country. These exotic/invasives are plants that reproduce rapidly and spread over large areas, displacing plants that are native to our region. Invasives often become a monoculture that has little ecological value to our native mammals, insects and birdlife. 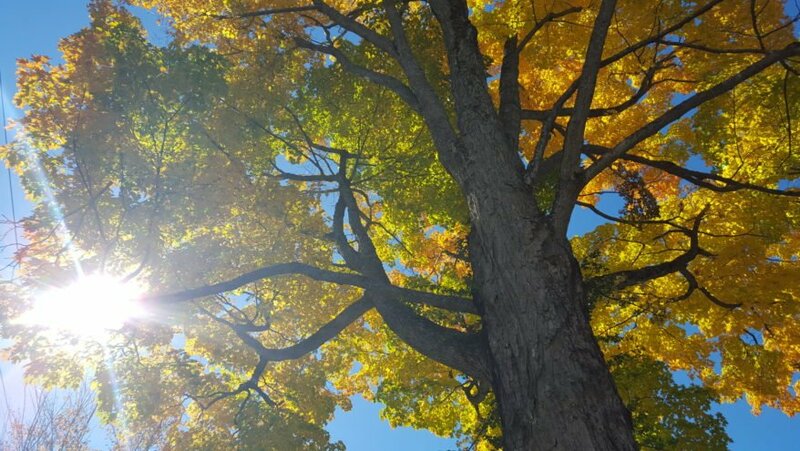 In the Wissahickon, there are several dozen trees, shrubs, vines and herbaceous plants that now thrive where native plants once grew. When you are walking in the Wissahickon in November be sure to keep your eyes open for a tall shrub with small fragrant yellow flowers. Our native Witch-hazel blooms at this unlikely time of year when leaves are mostly fallen and the forest is gray. 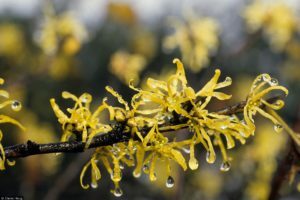 Depending on how much sunlight they receive, these shrubs can be profuse bloomers or just have a scattering of twisted spider-like fragrant flowers, but they are a wonderful surprise in late fall. The leaves on Witch-hazel are opposite, rounded, (obovate) with coarse teeth, and quite large, measuring 5-15 cm. They too turn yellow in the fall and are often hanging on when the flowers appear. This shrub is usually multi-stemmed with a vase-like shape, growing up to 20 feet. Witch-hazel is common in moist rocky woods throughout our region. You can spot several along the Early Implementation Trail project between Bells Mill Road and the Covered Bridge. 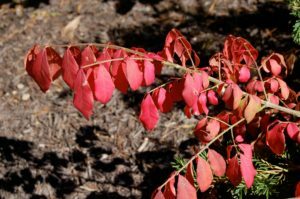 Burning Bush is a favorite shrub in home and commercial plantings. Its brilliant red fall foliage is indeed spectacular. It can be identified at other times of the year by its corky “wings” that stick out from the twigs and branches. Euonymus is a medium sized shrub usually growing 4-6 inches, but sometimes much larger. It has multiple stems, and the dark green leaves grow in pairs along the stems. Euonymus is a popular shrub because of its easy care and fall color. It has been spread throughout our Park by birds, which eat its inconspicuous seeds and drop them everywhere. If you are walking in the woods in October and see a brilliant red shrub, the chances are good that it is Euonymus. Burning-bush originated in Asia, does not provide high quality food for our native birds, and displaces other more valuable shrubs in our woodlands.